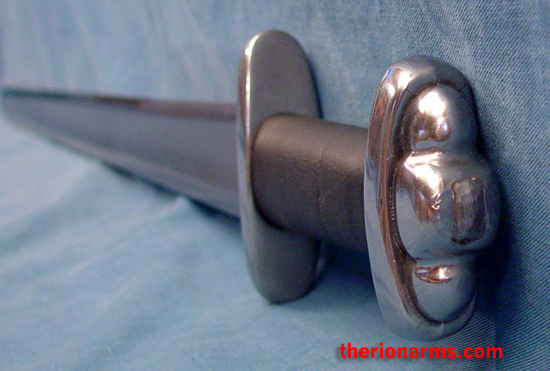 This is the fifth generation practical viking sword. 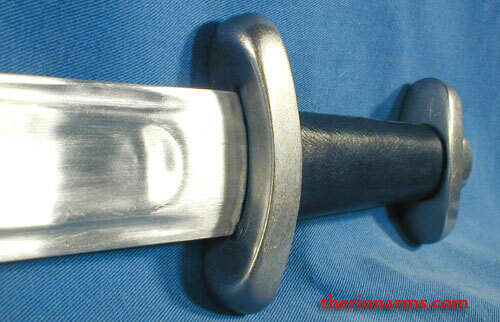 This reenactment/stage combat/sparring/training sword features a widely fullered blade with a beefy tang, rounded edges and a rounded tip (making the sword safer for full-contact use. Not "safe, "safer" - blunt swords are still weapons! (duh)). The scabbard is a fiberglass epoxy resin with suspension hangers for wear. If you're looking for the ultimate combination of price and functionality in a training or combat art performance viking sword, this is the weapon for you. Historical reproduction timeline - The first generation had a flattish blade and a flimsy tang. (No pictures available, TherionArms did not offer the original version). 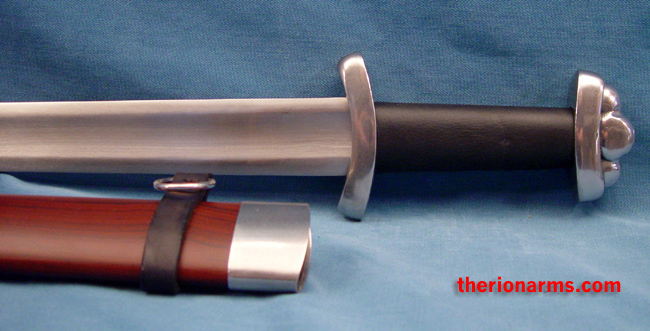 The second generation, which quickly became immensely popular with Western martial art students and film, stage, and live steel combatants, widened and legthened the fuller and solidified the tang, making it a lot more durable. Here are pictures and measurements of the second generation sword. The third generation had an even beefier tang and a slightly longer blade than the second generation. Here are pictures and measurements of the third generation sword. 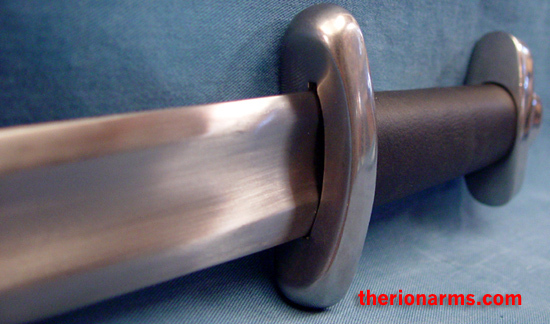 The fourth generation sword was introduced in 2005, and had a lighter blade with two long fullers near the edges. The fifth generation reverts back to a more historicaly correct single fuller, and is totally sweet (as you can see above). Remember, folks, 'viking' is an occupation, not a nationality, and it's alway better to pillage *before* you burn.